Sometimes Devin Franklin, Director of Programs at Flying Deer Nature Center in New Lebanon, likes to pass around a flint and steel set and have each student light a small pile of thistle down. They count how many times they strike before a flame erupts. Then Franklin turns to the child with the most strikes and says, “Now you’re going to be the one who lights the big fire.” The group cheers that child on as s/he lights a pile of thistle inside a tipi of dry sticks and kindling. “I like seeing the look on that child’s face after accomplishing a thing like that,” Franklin says. 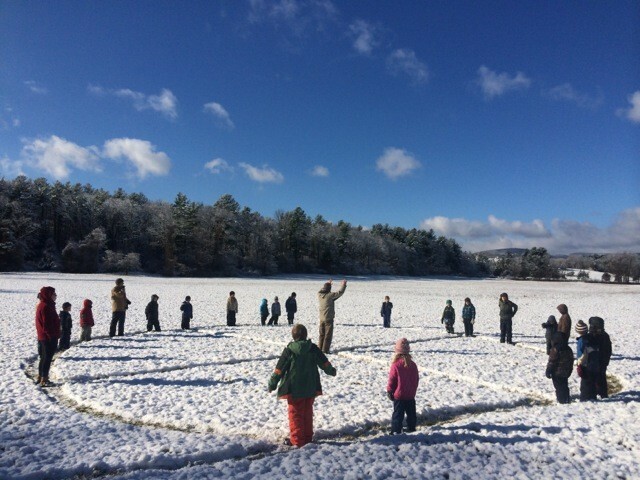 On Flying Deer Days with schools in New Lebanon, Chatham, Williamstown, and Pittsfield, educators from Flying Deer Nature Center offer a weekly nature immersion experience in which students spend the day exploring the natural landscape in an outdoor classroom. Through their homeschool, after school, weekend, and summer camp programs, they co-create exciting and educational cross-curricular experiences in nature. And on December 28th and 29th, kids can join the Snowy Owl Vacation Camp for wintery fun like ice fishing, snow fort building, animal tracking, and general wild adventuring. “Our predominant formal educational system emphasizes cerebral, metric-based learning and de-emphasizes kinetic, creative, and play-based learning,” Franklin says. “Most of us have forgotten what it means to learn as a human being because we’ve forgotten the value of sitting still for five minutes beneath a tree.” At the vacation camp and in all of the Flying Deer programs, kids learn to wonder about the natural world and internalize new possibilities for themselves as they awaken to the joys of self-directed learning. Snowy Owl Vacation Camp at Flying Deer Nature Center, 5 Abode Road, New Lebanon: December 28-29, 9a-3p, ages 7-12, $110. Check out their website to register and for more info. Don’t miss the Hide Tanning Workshop, February 26th-28th, when adults and teens can learn the Paleolithic art of creating a beautiful, functional fabric using only natural methods. There are also more vacation camps for ages 7-12 in February in New Lebanon and Sheffield, Mass.